Welcome to The JosieJo Show. I usually say this last, but this week I'm going to say it first while you're still paying attention “thank you for listening”. I really do enjoy doing this show. I do try to inform and entertain. One thing I can promise you is that each show I'll bring you tracks that I like and hopefully every now and again you'll like some too. Who knows, you may even find your new favourite tune. This week I have a haunting duo from Liverpool, a wonderful singer-songwriter from Southend-On-Sea in Essex, England and a sneak preview at one next week's pop-punk band from North Wales. First up that duo from the city of song. Windmill are Mick Dolan and Dawn Williams and they are on the superb Jack To Phono record label; that's the same label that Ring Ring Rouge are on. You may have heard Ring Ring Rouge on previous JosieJo Shows. If not get yourself to the archived shows after you've listened to this one. Go to www.josiejoshow.com and click “listen to the show” Other Jack To Phono artists I can highly recommend are Bird, The Tea Street Band and Thomas Eno. Windmill are worthy of this company. They sound much greater than just a duo. Their sound is beautiful and has been described as “harrowing”. For a more eloquent description of Windmill than I could ever give check out Lauren Jones' blog www.themusicmanual.co.uk , but until you get chance to do that I'll try to do them justice myself. That was Windmill and their single “Birdman” available 17th February 2014 on Jack To Phono Records. From one beautiful vocal to another. Next up is Sarah Holburn from Southend-On-Sea in Essex, England. Sarah comes from a musical pedigree; her father is Jonny Holburn the drummer from The Penguin Party. Her talent saw her power through to the final of the Open Mic Uk competition at the National Exhibition Centre, Birmingham in early 2014. Her original music seems to have a charming simplicity, but the tracks are often connected with each other in subtle ways that are honest, unpretentious and informed by her upbringing by the British seaside. She released a 4 track EP “Oh My Goodness” in 2012. You can download her track “Ice-Cream” for free on her bandcamp page and her album “In Too Deep” is due for release in April 2014. Here's an example of that network within her work. “In too deep” is not the title of this track “Shelter”. Well obviously it's not, otherwise it would be called “In Too Deep” not “Shelter”, but it is an important line in this tune. It's a sea song like many of her others, but it is also a song about a relationship hence the line “in too deep” . You can see how that sense of the word “deep” works on several levels in her song. It has keyboards, great percussion and I love the use of pause and response. It is a song to sway to and the video, like the track itself, plays with angles and perspectives. Fall in love with Sarah Holburn, like so many others have before you and so many others will after you, this is “Shelter”. Welcome to the JosieJo Show. Each week I try and bring you two tracks from two different bands or artists. I dig around on the internet, I go to gigs, I listen to lots and lots of music from all around the world, across many genres and I find tunes that really appeal to me. Then I put them into this show and upload it for you to enjoy in your own time, wherever and whenever you like. Share it around, introduce friends to it or just sneak a listen to it on your own and make it your special treat. Just give it a go. This is the JosieJo Show. First track is by a really special lady. Leyla McCalla was born in New York to Haitian parents and her solo music is really informed by this cultural influence. After spending time in Accra, Ghana and returning to America to study music she found herself playing her cello on the streets of New Orleans. Leyla found the spirit and French influences of New Orleans really inspiring and joined the Carolina Chocolate Drops, an African-American string band. Her solo album “Vari-Coloured Songs” is a tribute to American poet and author Langston Hughes and calls on his work as well as her own original music and Creole influences from Haiti. She also calls on her friends from The Carolina Chocolate Drops as well as New Orleans' Don Vappie on tenor banjo and Luke Winslow King on guitar. I was introduced to Leyla's work by a friend, Charmion who is fascinated and passionate about world music. One of Leyla's track featured on a compilation CD that came with Charmion's subscription to Songwriter magazine and she immediately found Leyla's tunes inspiring. She plays the album whenever she needs a lift. She plays it to her children and in the car, whenever she needs a bit of oomph. Yep. It gets me every time. Leyla is gigging crazy right now. What I've seen of her on YouTube she is beautiful and dignified live. So what's next I hear you cry? 3 Daft Monkeys of course. This is essentially a band of wanderers. Formed in 1999 by Tim Ashton and Athene Roberts. They have extremely strong celtic roots and a theatrical style that goes through and beyond the music and these guys have music in their very souls. Athene the fiddle player started playing at just four years old when she started using an tiny violin which was an ornament on a friend's wall. The drummer, Richie used coloured pencils as drumsticks on empty ice-cream containers when his percussion education began. Luke, the bass player, has his own solo projects and is on the bill to play Ferocious Dog's December festival Dogfest in Warsop England. I'll be there and I can't wait. 3 Daft Monkeys are playing a gig in La Verriere in France on the 21st March 2014 and lots of UK Festivals, amongst others, Bearded Theory, Boomtown and on the 12th April they are on the list of superb acts to play Dan's birthday bash. That's Dan from Ferocious Dog. I really will have to play you some of their tracks, but for now back to 3 Daft Monkeys. Their sixth and new album “Of Stones and Bones” is out right now and it is rooted in the landscape and heritage of Cornwall, England. The tracks are based round the stories and myths of this mystic and celtic land. This track “Morwenna” is no exception. It is evocative and emotional and has a swirling gypsy feel. It feels almost mesmeric which is beautifully fitting since it is a tale of a watery siren drawing the hero into an impossible relationship. It's heart breaking stuff, but the track really takes off in a very life affirming way. It's folk, rock, gypsy madness in the best possible way. Such a great track and a superb ending. Follow me on twitter @josiejoshow for news, events, gigs and releases, find me on Facebook for extra content and read a text version of the show on Blogger and Tumblr under the handle JosieJo Show. Welcome to The JosieJo Show number 18. This show I'll bring you two great tracks by two different artists and a new release from Ring Ring Rouge. We've played Ring Ring Rouge's track “Dr. Feelgood” on Show 15 of The JosieJo Show and it was one of my chosen tracks of my birthday special edition of Round At Milligan's last year. You can find easy click links to all the Round At Milligan's shows and the archived JosieJo Shows on my very own website www.josiejoshow.com. There you can also find the back story of why I started producing this show for you aswell as photos and links to the bands and artists played on the show. If you like what you hear on those shows or in the next 15 minutes then seek these guys out and tell them you like them. Music is so readily available these days and that dialogue between artist and fan is more essential than ever. For extra content including videos and links to free downloads go to my Facebook page; search for josiejo (all one word) and show and it'll take you right there. For news, events, gigs and releases follow me on twitter @josiejoshow and to read a text version of the show with links to the tracks find me on Blogger and Tumblr. Oh I am so cross-media or whatever the term is. Enough of the business let's get to the music. First up a bit of Canadian folk with a difference from Markus Michelucci and his project Sound Refuge. Residing in London, England Markus brings you bardic ballads and colourful, creative stories with bending guitar sounds and growling harmonica. His full length album, “Excuse Me, I Think You're In Neutral” and his single “Let It” are brought to you with a deliberate intention to make you think that he is sitting in the room with you, playing and performing just for you. He is about to embark on a European tour in the spring of 2014 bringing his passion and in depth knowledge of guitars and the subtle differences that each one makes to a wider audience. This guy knows his axes and you can read his tonal musings on his blog available on his website www.soundrefugemusic.com where you can also hear his folky blues style. So that's what “Refuge In E Major” sounds like. Check out his other tracks they are quite different. Next up the title track from the brand new EP “Radiate” from Australian born Bela Takes Chase. Bela does do small acoustic sets, but recently she's been performing with her full band and it really sounds great live. Excitingly though she's playing a very special acoustic gig in the south of London UK on the 13th February 2014 at the Bedford in Balham. She's playing, not just with her usual super band, but also with a string section, a special guest rapper Nash and Joshua Rigal on trumpet. She's always amazing live and really presents a fragile, yet strong figure on stage. Her intensity is well quite intense and you can almost feel the audience fall in love with her as she draws them in. She's also on the bill to play a festival very local to me called Buryfields in Chesham on the 21st June 2014 and tickets for that are selling fast. Check it out on Facebook if you're interested. The track I'm playing you on this show is quite exquisite and entrancing. It's called “Radiate” and you can find a stunning video for it on youtube. I do love a video that tells a story. It's gorgeous and really worth seeking out, but it's the production of this track that I find really stunning. It's mixed and layered with seemingly effortless precision. The whole track swells from the outset, but its tempo and mood changes really take you on a journey. It has a sense of golden emotion that can travel half way across the world as she describes her yearning for her home and those that she misses. It's a song about knowing ourselves even when we are physically displaced. I can almost feel the heat of the Australian sun as her warm vocal swirls round the intricate keyboards, guitars and percussion. There you go. Bela Takes Chase and the title track of the EP “Radiate” that was launched just a few days ago in London. Don't forget that very special acoustic gig in Balham on 13th February and join her 34 thousand followers on Facebook to keep up do date with Bela's gigs and releases. Well hello. 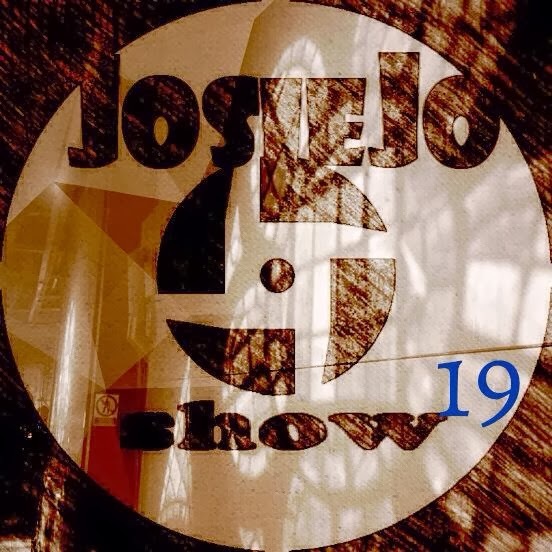 This is the JosieJo Show - two great tracks by two different artists brought to you for your aural delight. Music is intensely important to me and I hope to convey this to you, but most of all I just hope that you like what these musicians do. You may not like everything I play. Maybe though you'll prick up your ears and go “ooo I like that. Who's that?” If you come across a new favourite band or artist and they move or inspire you in any way, then all my work will be worth it. What do I have for you this week? Two English blokes both immersed in music from an early age, both super musically multi-talented and both producing great music. The first of these is King Size Slim the fat roots and blues, musical production of beautifully bearded Toby Barelli. He was sent to me via Funke & The Two Tone Baby and like Funke he's insanely hard working. He did over 152 gigs in 2013. Think about that...that is half the year..like every other day, often three or four gigs a week. Bloody astonishing if you ask me. A quick tour round his website www.kingsizeslim.com and you get the impression that he takes his guitar everywhere and creates music on the move. His videos show him playing on the back of a golf buggy at The Big Chill festival and going unconcernedly up and down on the Funicular railway at Hastings. He's not just a guitar player though. Oh no, his music is hand clapping, broom sweeping pot and pan bashing, rooted in blues brilliance. He started playing with whoever would let him when he was just 14 and his persistence gained him a place in the 80's Two Tone legends that are The Selector. His massive experience makes his sound live and direct even on his latest recording “Milk Drunk” his album released by Treehouse 44. Oh it's so good. You know I'm going to be extra lovely this week and let Jim play you out with an acoustic track that he wrote whilst looking out of an apartment window and observing the rhythm of the day. He also includes the experience of seeing a couple ballroom dancing in full sequinned regalia in a park in China. Don't forget to follow me on Mixcloud so you'll know when the next show is uploaded, follow me on twitter for news, events gigs and releases and visit and like my Facebook to make me feel loved and get extra content. In all cases if you search for JosieJo (all one word) and show and you'll get right there. I also post to blogger and tumblr under JosieJo Show and if you have any suggestions or comments get in touch by messaging or tweeting me or email me josiejo@josiejoshow.com Finally here's second track by Jim Cemlyn Jones. It's “Skateboard Park” Enjoy.